If you could only eat one carb for the rest of your life, which one would it be? It's a silly question, I know, but one which gets your brain whirring nonetheless. The sort you can ponder on and debate during long car journeys or late summer's evenings, sat outside in the dwindling heat with just one more glass of wine before bed. (A bit like our family discussions thrashing out choices for Desert Island Discs. Hours spent sat around the kitchen table considering the perfect balance of sentiment, memories, pleasure and exhilaration. My parents are just waiting for their invitation). Pilaf, sushi, paella, sticky rice, risotto, rice pudding, tah dig, jasmine rice. Baked potatoes, dauphinois, good old roasties, loaded skins, buttery mash, gnocchi, patatas bravas, potato cakes. You get the picture (and I'm barely scratching the surface). Countless ways to serve each humble carb. I am undecided. My gut tells me it's rice. But the pleasure I get from baking and eating a loaf of sourdough is pretty insurmountable. Freshly baked, thickly sliced and dunked into a bowl of steaming hot soup. Or toasted, spread with good butter and marmite. What would you dip in your soup if you didn't have bread? Noodles. NOODLES. What would I do without a bowl of steaming hot broth, noodles, greens and marinated tofu. My go to dinner on the rare occasion I'm eating alone at home. Restorative when I need a pick me up. Pho, ramen, laksa. These I am not sure I would wish to forgo forever. And yet, there is little so comforting, so homely and so satisfying as the humble chip. Chippy chips. Chippy chip shop chips. Piping hot, wrapped in paper, doused in salt and malt vinegar, and eaten on the leisurely amble home from the chippy. Proper, homemade chips. Perhaps not made in the old greasy chip pan like Dad did when I was growing up (and sadly cause of many a kitchen fire for some), but you know, fried. As they should be. There is whole nation of children growing up in the belief that chips are cooked in the oven. From the freezer or the M&S chilled cabinet and straight to a baking tray. Chips go with everything. My favourite comfort food growing up was Granny's cauliflower cheese (made with extra cheese) and chips. My boys like them with homemade fishfingers and obscene amounts of ketchup. I'm quite partial to them stuffed between two slices of well buttered white bread. But if you ask my friend Jassy, she'll tell you that chip shop chips are perfect with crab. Especially crab with cider, creamand herbs. Peel the potatoes and put them into a bowl of cold water. Taking one potato at a time from the water, cut the potatoes lengthways into finger sized chips (approximately 1cm to 1.5cm diameter) and return them to the bowl of water. Bring a large pan of salted water to the boil. Add the chips and simmer for 5 minutes (but no longer, otherwise they may begin to fall apart). Drain the chips and put them on kitchen paper until completely cool. Fill your deep fat fryer to the maximum level with the rapeseed oil and heat to 130°C (the amount of oil you will need will depend on the size of your fryer – I have a mini one which only takes 1.25 litres - and fry in batches, if you have a large fryer you may need more oil so check the instructions). Put the cooled chips into the basket of your deep fat fryer, lower into the oil and cook until a pale crust starts to form on the chips (about 7-8 minutes). Drain the chips and put them on fresh kitchen paper until completely cool. (If you want to get ahead, you can cook them up to this step and then leave in the fridge, covered, for up to 24 hours. Heston says 3 days, but I’m not so keen when they’ve been sat around that long and who has the self control to resist giving those chips their final fry for 3 days anyway?). 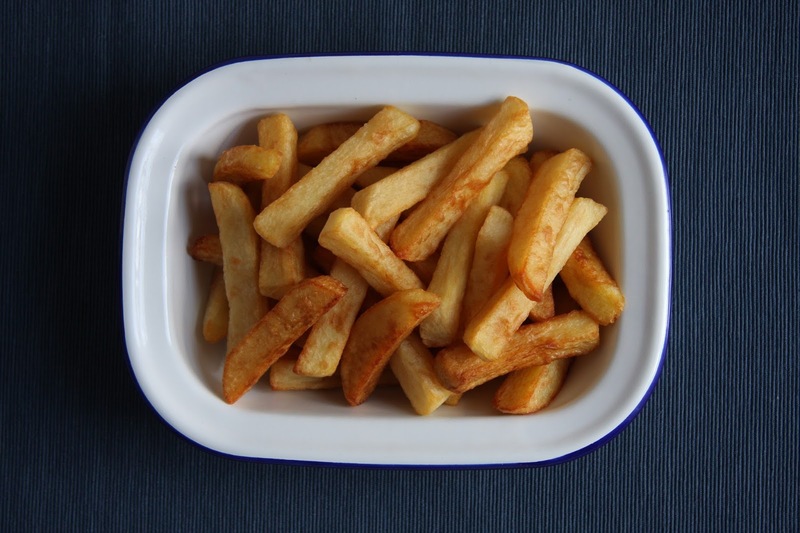 When you are ready to finish cooking the chips, heat the oil in your deep fat fryer to 180°C. Put the cooled chips into the basket of your deep fat fryer, lower into the oil and cook until golden and crispy (about 4-5 minutes). Drain the chips on kitchen paper, put them into a serving bowl and sprinkle with plenty of good quality salt flakes. *I use Waitrose Essentials vegetable oil, which is 100% rapeseed oil. Jassy uses groundnut oil for her chips (as does Heston). It does give a better flavour (and I think is better at this heat), but it is much more expensive. You can reuse the oil – once cool, drain it through a sieve into a suitable container and store in a cool place until you next make chips. Probably the next day. I first made this ‘pink labneh’ with my two young sons – one who loves labneh and one who loves everything pink – as a way of reintroducing them to beetroot. Both ate beetroot as babies (one perhaps more enthusiastically than the other). I remember their messy, pink stained faces and bibs that never came clean again. But when they hit their selective eating phases during their toddler years, beetroot was high up the rejection list. I can see why. I love beetroot for its sweet, earthy flavour, but it isn't a vegetable that is eaten every week, so it becomes alien. Viewed with suspicion by cautious eaters. The vibrant colour of this labneh reeled them in eventually. It's hard to resist something so bright. Simple to make and visually stunning, this beetroot labneh works well as a pre-dinner dip or as part of a more substantial lunch. I like to serve it with dark rye bread and smoked mackerel. Begin by cooking the beetroot. Preheat the oven to 190°C (170°C fan). Cut the leaves off the beetroot and discard them, but do not top and tail the beetroot at this stage. Wash the beetroot and wrap it in foil. Place the foil wrapped beetroot on a baking tray and put it in the oven. Roast for 1 to 1½ hours until cooked through. You can test whether the beetroot is cooked by unwrapping the foil and piercing the beetroot with the end of a sharp knife. The beetroot is cooked when the beetroot is tender and the knife slides easily into the beetroot. Leave the beetroot until it is cool enough to handle. Once cooled, top and tail the beetroot and peel it (it is probably a good idea to wear washing up gloves to handle the beetroot, otherwise you will end up with pink fingers). The skin should rub off easily. Put the peeled beetroot into a food processor or blender and blitz to a purée. Depending on the size of your beetroot, you should end up with around 150g beetroot purée. In a small bowl, mix together the yogurt, lemon juice, 150g beetroot puree and the salt (if using – leave the salt out if you are making this for babies or young children) until combined. Line a sieve with a piece of muslin and place it over a bowl. Put the beetroot mixture into the muslin-lined sieve. Draw up the sides of the muslin and twist together so that the beetroot mixture forms a ball (see photo below). Leave in the fridge for 12-24 hours to strain. This is the full version of my Beetroot Labneh recipe which appeared on the Peter's Yard website as part of their 7 Dips for 7 Days campaign earlier this month. On a grey and dank Winter’s day, when even the thought of waiting at a bus stop or standing in the playground whilst your toddler heads for his five hundredth go on the slide fills you with frostbite dread, this little salad is a shining beacon of lunchtime pleasure. Vibrant, tart and crisp. Everything a winter salad should be. I am a little ashamed to admit that when I encountered a blood orange for the first time, it was not love at first sight. In much the same way as I have done with my boys in recent years, my Mum proffered this golden globe like a precious jewel to behold. A rare, seasonal treat, which undoubtedly cost her an arm and a leg, but which she was excited and happy to share with me. I wasn’t a squeamish child, but I just could not see past the word ‘blood’. I truly believed that this precious orange had been tainted, so I failed to understand and share my Mum’s enthusiasm. Making up for all those lost years I now gorge myself on them. Particularly Sicilian blood oranges which, for me, are the best. And what’s more, I don’t have to share. For now at least. In a medium sized bowl, whisk together the salt and lemon juice with a fork. Add the oil and whisk again. Set to one side. Remove the leafy fronds from the fennel and set to one side. Cut the fennel in half lengthways and then, using a sharp knife or a mandolin, slice the fennel as thin as you can. Put the sliced fennel into the bowl and turn well in the dressing. Using a sharp knife, slice off the top and the bottom off one of the blood oranges. Sit the orange flat on a chopping board and remove the skin and pith by slicing the knife downwards between the flesh and the skin. Work your way around the orange until all of the skin and white pith has been removed and discarded. Set to one side and repeat with the remaining three blood oranges. Slice the blood oranges through the centre into slices about ½cm thick. Roughly chop the toasted hazelnuts. 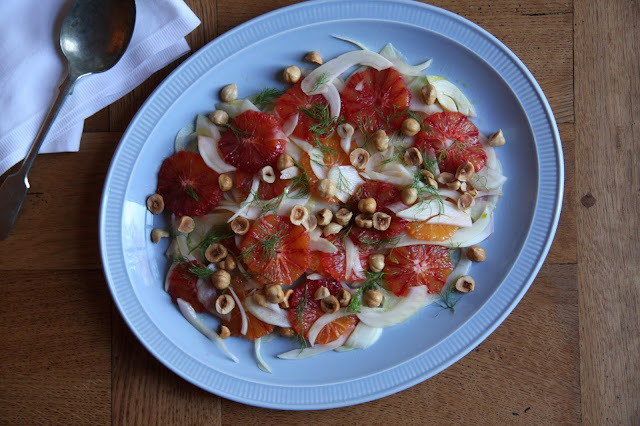 Arrange the dressed fennel on a serving plate and add the blood orange slices. 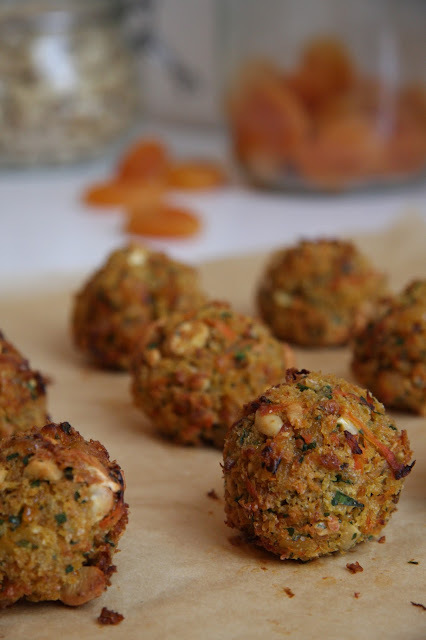 Scatter the toasted hazelnuts and fennel fronds over the top. Serve straight away. *If you have a bottle of good hazelnut oil, substitute 1 tablespoon of the rapeseed oil for hazelnut oil. Red cabbage and sprouts. Two vegetables best eaten raw. After a childhood of sprout and red cabbage aversion (in which I am fully aware I am not alone) it was a revelation to discover that neither require nor, in my most humble opinion, benefit from cooking. Nine. That was the number of sprouts on my plate as a child. Nine. What sort of parents make their sprout-detesting child sit and look at nine whole sprouts? Mine. Although of course they'll laugh and dismiss the very idea if I ever mention it. I recall my attempts to disguise them from myself by smothering them in mashed swede (why sully a decent element of my roast dinner with the dreaded sprouts when I could combine two of the most revolting foods on my plate?). Luckily for me I had younger siblings who were rather partial to a sprout or two. So with a little distraction and the odd flick of a knife here and there, I managed to offload a few. The requirement to eat nine did eventually reduce to three. Three. Still three too many. The first time I willing ate, and (gasp) actually enjoyed, sprouts was with family in France last Easter. A simple salad of finely shaved raw sprouts, lemon, cheese and hazelnuts made by Lisa. I even had seconds. Red cabbage was no better. As a child I only ever knew it slowly braised with apple or pickled and served straight from the jar along side homemade shepherd's pie. (I'm guessing that's a northern thing). Pickled I could live with, crisp at least, even if the vinegar it was doused in was of the most mouth-stripping, astringent kind. But braised was up there with the worst of the over cooked sprouts. Slightly sweet, heady with clove and allspice. It has a bit of the marmites about it. Love it or hate it. 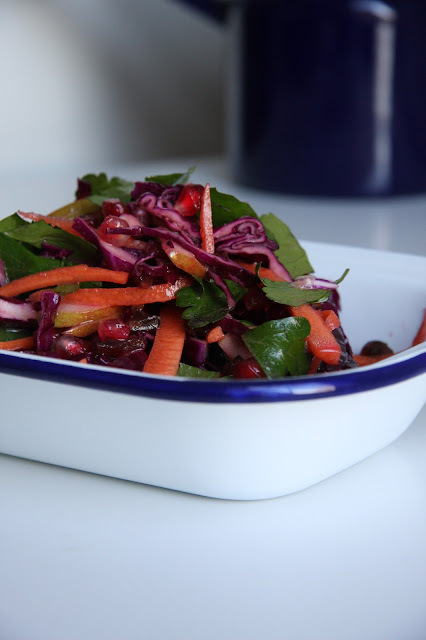 A winter slaw is where red cabbage excels. I'm not overly fond of the traditional coleslaw. Vegetables which have spent too long languishing in a creamy, almost cloying, sauce made with excessive amounts of cheap mayonnaise. (Although that is not to say that a simple, well made celeriac rémoulade would be banished from my plate. An entirely different beast. Crisp celeriac given the briefest of introductions to lemon juice, Dijon mustard, good mayonnaise and a little natural yogurt. Perhaps tinged pink with grated beetroot stirred through moments before serving). When a red cabbage finds its way into my fridge it is for the sole purpose of making a salad. A crisp, colourful, wintery salad. Or three or four. It is a bountiful vegetable which keeps on giving, staying fresh long after the parsley has wilted, making this salad a great fridge foraged lunch. Begin by making the dressing. Put the salt and lemon juice into a medium sized bowl and whisk with a fork. Add the olive oil and whisk until combined. You can use a mandolin to prepare the carrot, red cabbage and apple, or (like me) a chopping board and a big sharp knife. Julienne the carrot and finely slice the red cabbage. Add them to the dressing and stir well to combine. Finely slice the apple (I like to leave the skin on) and add to the carrot and red cabbage before it has chance to start turning brown. Remove and discard the stones from the dates and finely chop the dates. Remove the seeds from the pomegranate (I do this by holding the half a pomegranate over a bowl and bashing the skin side with a wooden spoon or rolling pin). 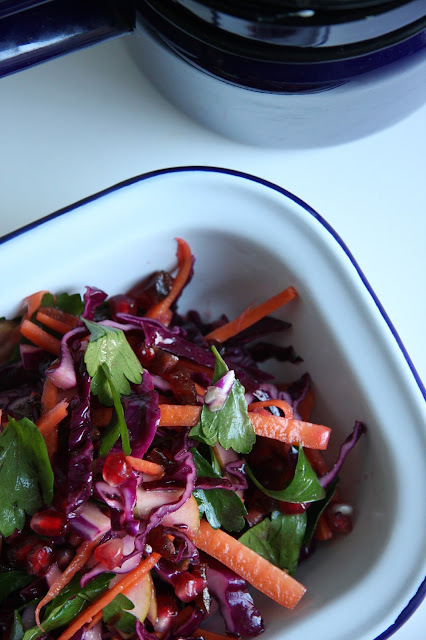 Add the dates, pomegranate seeds and flat leaf parsley to the slaw, stir and serve immediately.